NexXxos is back! This back plate is the perfect addition to your water cooled graphics card, improving looks and cooling performance! The cooling concept of the ATXP/NVXP water blocks is a very well-balanced one, but only little of the water blocks can be seen as they usually face downwards in the enclosure. Hence great attention was paid to the surface finish of the back plates for maximum effect. This was achieved with anodized aluminum: A perfect finish, and even after small mishaps during mounting the color remains consistent. Of course the back plate is shipped with suitable, copper plated M3x12mm hexagon socket screws. Aluminum as the material of choice also has another advantage: With this lightweight material less strain is put on the sensitive graphics card slots! The Alphacool back plate also contributes to the rigidity of the graphics card, preventing it from bending and twisting. The additionally applied thermal pads under the back plate also contribute to the cooling of the sensitive components on the graphics card. 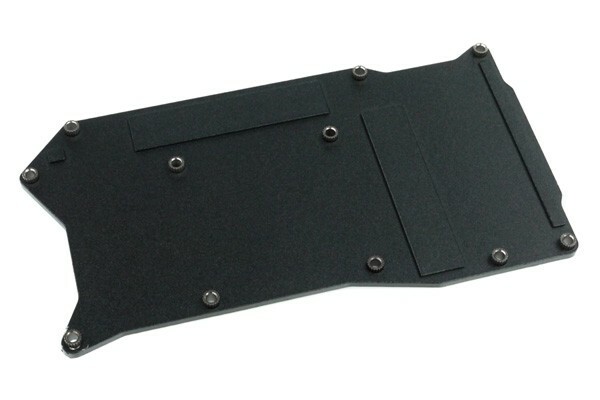 Of course the back plate is fully SLI/ Crossfire capable and hence perfect for use in a Multi-GPU system. In the extent of delivery you will find mounting screws and thermal pads – No additional material is needed! A multi-lingual (GER, EN, FR) mounting manual and tools allow easy and quick installation of the unit. The mounting manual can be found here.